The Frank Moravcik Band and the Chardon Polka Band are ready to invade the Texas polka scene with music of the Slovenian kind - one traditional and one with attitude. Here's an excerpt of articles featured in the print edition November 2014 issue of Texas Polka News. Click here to subscribe to the newspaper. Are you ready for some Cleveland-style polka? Ohio, that is. You will have two chances to hear one of the best bands from up north right here in Texas in November. The Frank Moravcik Band will play Saturday, Nov. 8, at the SPJST Lodge 88 in Houston, and on Sunday, Nov. 9, at historic Sefcik Hall in Seaton. I had a chance to talk to Frank as he traveled to New Jersey for a Saturday night dance and asked him what he likes about playing in Texas. Frank said he had a big positive response to it since it was different from the traditional Cleveland bands with a faster tempo and lots of brass and tuba. He had to give up the polka show because he was playing every weekend and it became harder to find the time to record the show between that and his day job of writing computer programs for robotic equipment. A true hero of mine, he also quit his day job to devote himself full time to his music. “Yeah, but they called me back and said, ‘We could really use you,’” he said. “I told them I had to be on the road a lot with my music, but they said that was okay, to take off whenever I needed to.” Sigh, I said. In addition to his appearances in many states including Texas, Arizona, New York, New Jersey, Pennsylvania and Michigan, Frank has traveled the world to play in Germany, Amsterdam and on Caribbean cruises. He and Linda have another cruise coming up on March 7-14, 2015, that will include their friend Tony Klepec, a button boxer with a smooth Slovenian style. Frank and his band played at Sefcik Hall last year with Czech & Then Some, and was glad to see polka lovers in their 20s and 30s at the dance. “Texas is doing really well with drawing a younger crowd to the dances. It’s great to see,” he said. Be ready to give the Frank Moravcik Band a big Texas welcome on Nov. 8 and 9. And don’t worry country music fans, Frank promises to play some tunes by Eddie Arnold and George Strait and throw in some Elvis and Jerry Lee Lewis. Chardon Polka Band - Joe Dahlhausen (drums), Emily Burke (sax), Jake Kouwe (accordion and band leader), Paul Coates (tuba/bass) and Mike Franklin (banjo). 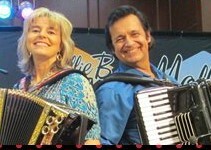 One of the hottest new groups to hit the national polka circuit is the Chardon Polka Band from Cleveland, Ohio. Texas polka fans will get two chances to see the band – at Wurstfest in November and the Tomball German Christmas Market in December. After wrapping up photography sessions for the band’s reality TV show, Polka Kings, set to debut next summer on REELZChannel, and a worldwind tour with gigs in St. Louis, Tulsa, Indianapolis, Bethlehem, Penn., and Hunter Mountain, NY, Bandleader Jake Kouwe and I corresponded via email. His first comment was, “We are so excited to be coming to Texas! We have heard nothing but good things about the Texas polka crowds. There are so many great festivals there. We cannot wait to burst onto that scene. Texas is rich with ethnic flavor. We love a crowd that is enthusiastic about polka,” he said. The band will be making the trip in their old Ford van. “It's big and ugly and makes some noises once in a while. It's cozy though. It may be a piece of junk, but it's our piece of junk!,” Jake said. Jake actually started the band in high school, calling it the Chardon High School Polka Band, 10 years ago. Uncool? Guess not, since Jake was voted homecoming king his senior year. “We were a cheerful and sprightly bunch,” he recalled. Why start a polka band? “I just love polka! It’s happy music. Artists like Brave Combo (Denton) and The Polkaholics (Chicago) allowed me to dream big and visualize putting my own spin on it. I think everyone in our group has a different way of seeing things musically. I believe we bring a lot to the table that hasn't been done with the genre before,” he said.